The Portuguese composer Diogo Dias Melgás was a bit of a throwback. Born in 1638 in the little Alentejan town of Cuba, at the age of eight he made the short 60km trip north to the great Cathedral city of Evora, to become a choirboy in the Colégio da Claustra. The musical foundation there was one of Portugal’s oldest and most distinguished. It had already produced the great composer Manuel Cardoso, as well as João Lourenço Rebelo, who first brought the spirit of the Baroque to Portugal, and was the favourite composer of the music-loving king, João IV. Before long Melgás became Rebelo’s pupil. He spent the rest of his life at Evora, becoming mestre de capela there in 1678. When he died in 1700, blind and penniless, he was revered by all for his simplicity and modesty. The music he wrote there was highly prized. Copies were made for Lisbon Cathedral, where the scribes sometimes could hardly believe the harmonic daring of Melgas’s writing. Because if in general composers of the Iberian peninsula were well behind the musical currents of Italy, the real spirit of the baroque – its fantastical and overwrought imagination – found an echo in the local brand of religion. Melgas’s music, on the page so simple, elegant and well-written is at the same time communicative and full of subtle fantasy. Four singers of the Ensemble William Byrd sing them, more or less, straight. François and Bernard Baschet started their research into sound in 1952. François was the sculptor, Bernard the engineer. Among their early instruments were an inflatable guitar and an aluminium piano. They soon found themselves in the vanguard of “sound sculpture”. They divided their work into two types: sculptures sonores and structures sonores. The first are primarily sculptures. Made for museums, art galleries and architectural projects, their appearance is more important than the sounds they can make. Among the most notable, musical fountains for the Mexico Olympics of 1968 and the National Gallery in Berlin (1974), and the Belfry at Cergy-Pontoise. On the contrary, the structures sonores are musical instruments made for musicians, and their raison d’être is the sound they make, which is more important than their appearance, although that aspect is hardly neglected. The Baschet brothers preferred to create instruments which would allow interpreters to express themselves, resisting the enthusiasm of the 60’s and 70’s for electronic music. Visually striking, the structures sonores are crafted out of steel and aluminium, and amplified by large curved conical sheets of metal. Foremost among them is the Cristal Baschet, with a keyboard of five octaves. 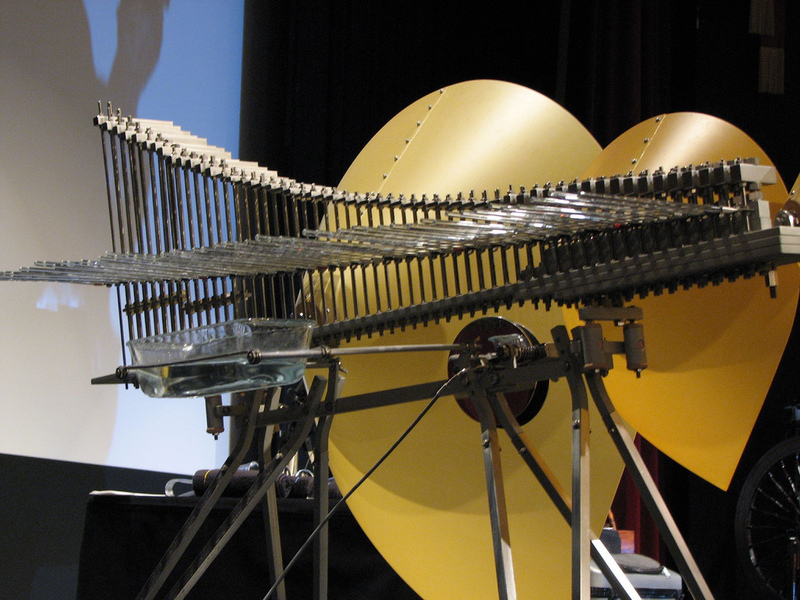 It is played by rubbing moistened fingers along the glass tubes, and the sound produced is amplified by fibreglass cones in the shape of flames. The sound it makes is sometimes like that if the glass harmonica (which was banned in the 19th century because it sent its players mad and prevented the crops from growing), the Ondes martinet or the Theremin. But it is much more adaptable and polyvalent than these, with a wide variety of sounds and phrasings possible. Michel Deneuve has been playing it for nearly forty years now. Although he has composed for it, most of his concerts consist of improvisation, constantly looking for new ways to invade modern music-making with its unique sound-world. Between the sobriety of 17th century vocal motets and an extraordinary instrument as modern as tomorrow the link is made by the keyboards of Yannick Varlet. There is a spinetta, based on a model found in Florence around 1570. Its spiky top notes complement a rich and sonorous bass register. There is an organetto – a small hand-held organ popular in medieval and renaissance times; also a small chamber organ useful for the purity of its basses and its fluty high register. Bringing it all together are his improvisations at the piano – jazzy, dreamy, violent – all the colours are there. Yannick’s background in early music means that his creations jump off from exactly where Melgas’s gorgeous little motets express themselves and search out the extraordinary colours Michel is creating on the cristal. Improvisations by Michel Deneuve, acknowledged virtuoso of the cristal baschet, and Yannick Varlet at different keyboards.